Cookable Food for Birds - DISCOUNTED & HEALTHY! 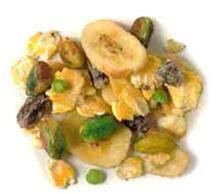 Extraordinary and nutrtious cookable foods to supplement your bird's daily diet. You asked for it, and now it's here!!! TOP's Parrot Food is happy to introduce their new Premium Birdie Bread Mix. Enriched with bee pollen, nature's super food! Recommended for Conures, Pionus, Greys, Goffins, Eclectus, Macaws, and others. Nuts, fruits, herbs and pasta are only a few of the plethora of ingredients which include cashews, soy, almonds, pecans, pistachios, walnuts, safflower, cranberry, carrots, oat groats, pumpkin, apple, shredded coconut, pineapple, chic pea, wheat, pine nut, pepita, whole star anise, beet, cucumber seed, cherry, green pepper, sweet potatoes, canary grass, peas and papaya. Can be fed dry or cooked. No artificial colors or flavors and no synthetic vitamins. No peanut blend. GMO free. Click here for cooking instructions.